Books of hours are illuminated personal prayer books. Books of hours usually have a calendar with astrological signs and seasonal images, a list of red letter days associated with local saints’ feast days (and special prayers) near the front. The calendar is followed by prayers, and Biblical texts and psalms associated with specific days. Specific cycles, like the hours of the virgin or the stations of the cross are important parts of the yearly cycle, and were somewhat customized to the location and for the owner. The book usually concludes with the offices of the dead. Books of hours were generally owned by the wealthy, and tended to be smaller than most medieval manuscripts, generally about the size of a mass-market paperback up to a trade hardcover. These books were for personal use and often elaborately illustrated. They were sometimes specifically commissioned for a specific person, and were often owned by women. They are consequently not only of interest as beautiful objects, but as beautiful objects that tell us a great deal about daily life. A fifteenth century Middle English anonymous lyric about the labors of the seasons asserts that in May “I am as lyght as byrde in bowe.” That certainly describes the typical May calendar images in books of hours Maying, courting, and hawking and horseback riding. May is a time of joy and of pleasure, therefore May is depicted as a youth, riding and bearing a hawk on his hand. The May calendar image from the British Library’s Queen Mary’s Psalter (BL Royal 2 B VII) perfectly fits Bartholomeaus’ description. The central portrait at the top of the page shows a young male aristocrat on horseback, a hawk on his hand. Below the illumination are the feast days for the month of May. The Queen Mary Psalter was produced in England, possibly in the area of London/Westminster, or East Anglia between 1310 and 1320. The text is in Latin, with captions for some images in French. The script is Gothic; Textualis prescissa for the calendar and Psalter and Textualis rotunda for the captions on the prefatory prayer cycle. The entire psalter is the work of a single scribe known as the Queen Mary Master. Although the psalter is named for Queen Mary Tudor (1516 — 1558), daughter of King Henry VIII, it predates her some two hundred or so years. Obviously made for someone with aristocratic status, it’s not really clear who had the psalter created, and several people owned it before George II in 1757 presented to the British Museum as part of the Old Royal Library. There’s a good post about the The Queen Mary Psalter on the British Library’s official blog. The illumination at the top of the calendar page, shown in detail below, shows a youth on horse, his hawk in hand, flanked by peers also bearing hawks. With lokkes crulle, as they were leyd in presse. Of twenty yeer of age he was, I gesse (General Prologue ll. 80–82). He was as fressh as is the monthe of May (General Prologue ll. 89–92). 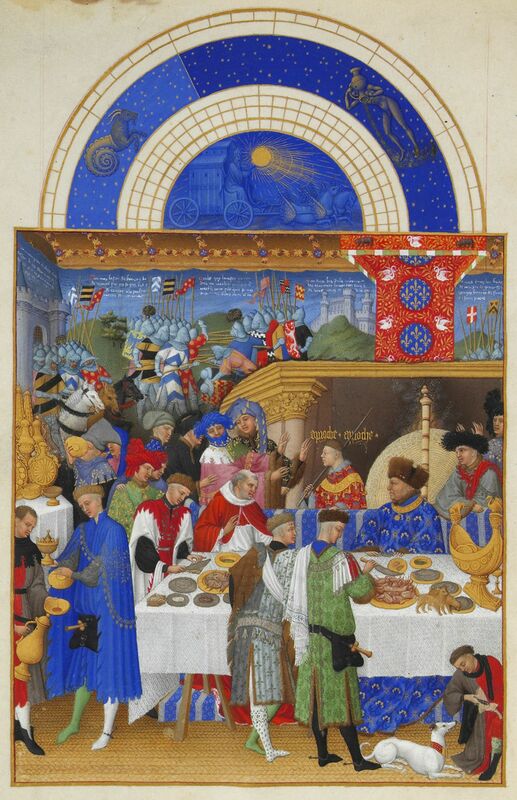 This is the May calendar page from the Très Riches Heures de Jean Duc de Berry. It shows one of the more popular labors of May, a May day outing or jaunt. This is the aristocratic version of bringing in the May, with richly dressed aristocrats on very fine horses, wearing May garlands, traveling with servants, including musicians. In the background is the Hôtel de Neslé, one of the Duke’s Paris residences, and the Conciergerie and the Tour de l’Horloge on the isle de la Cité,much as they look today. Notice the details of the two little dogs in the foreground, and the flowering shrub. I suspect, but can’t prove, that the horses as well as at least some of the riders, would have been known to the Duke. Various scholars have suggested that the gentleman in front with the garland and the very fancy robe with gold embroidery is the Duke himself, perhaps looking at his bride-to-be on the white horse. It is also interesting that three of the women are dressed in green, the color of spring, and of fairies. In this book of hours calendar image for April from the Très Riches Heures of Jean Duc du Berry (Musé Condee MS 65 F4v) one of the typical seasonal pastimes (or labors) is depicted; gathering flowers. But the primary emphasis of the scene is on the couple in the foreground exchanging rings in a betrothal ceremony, with what might be the young woman’s parents looking on (various attempts have been made to associate the portraits with real people). To the right two women are picking flowers. In the background on the right fruit trees in an orchard are blooming, and beyond that on the lake fisherman are using seining nets to fish. The chateau in the background was another of the Duke’s estates, the Château de Dourdan, in Essonne France. The most typical depictions in April calendar images from books of hours are scenes of planting, pastoral scenes in general. They often feature courting couples or people picking or holding flowers or blooming branches. In this book of hours calendar image for March from the Trés Riches Heures of Jean Duc du Berry (Musé Condee MS 65 F3v), the foreground shows a man ploughing with an ox. It’s a common motif in terms of the labors of the months in books of hours. The labors of March typically involve pruning trees or grape vines, or digging or ploughing in non-wine producing regions. In the foreground, a peasant, wearing leggings and a hat, plows with an ox. Above that, to the left, three peasants are working with the vines, probably pruning and re-tying them. Above and two the right, a peasant with a sack is doing something to a field. I suspect (but do not know) that he’s spreading manure on a field deliberately left fallow. It was fairly common to use a three-field system of crop rotation. One field was planted with wheat or rye in the fall, for human consumption. A second field was used in spring to raise peas, beans, and lentils for human use, and oats and barley for the horses. The third field is allowed to lie fallow, and rest. It would be plowed, working aged manure into the soil, and any spontaneous weeds and grasses could be used for grazing, resulting in more manure to be plowed under a second time. The field planted with beans, and lentils, with legumes in summer could be re-used the next winter for winter wheat or rye, because legumes, as nitrogen fixers, enrich the soil. Each year, the field used for a specific crop rotated among the three fields. I suspect the fellow with a sack is spreading manure that will be plowed under while the field lies fallow. The third field, off to the right, looks as if it’s already been planted. Across from it, on the top left, there’s a shepherd with his sheep and dog; he appears to be hurriedly covered, perhaps hoping to avoid the storm that appears hovering in the sky above. The castle in the background is one of several owned by Jean Duc du Berry; it is the castle of Lusignan in Poitou, famous for the legend about the fairy Melusine, ancestress of the Lusignans. Melusine, who reverted to a mermaid form, or in some versions, became a serpent from the waist down. on alternate Saturday. Melusine, after a spat with her husband Guy de Lusignan, Count of Poitou, transformed into a dragon, and flew off (hence the dragon flying overhead on the top right). 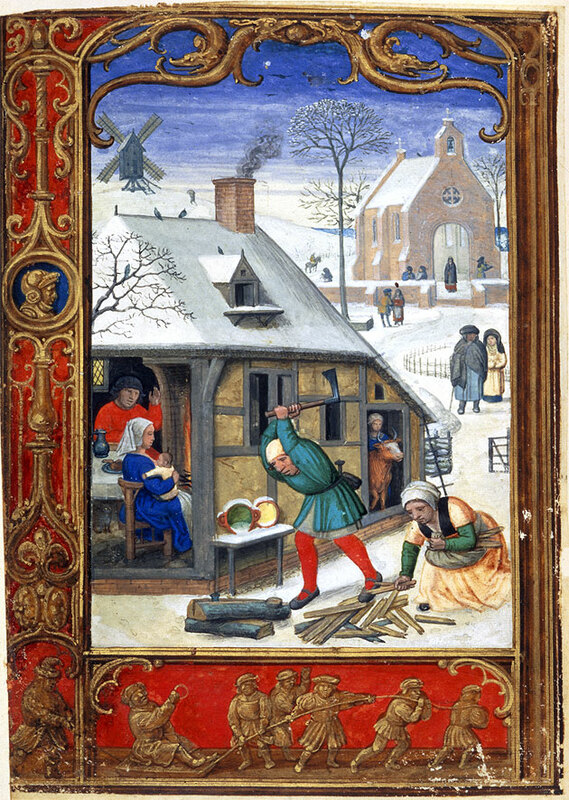 The calendar image for February in books of hours, like that of January, often features someone sitting by the fire, but calendar pages for February are rife with scenes related to the chill of deepest winter. Typically they feature the piscine astrological signs for Pisces. The saints’ days for February include St. Ignatious, and St. Bridget. This image from the February calendar page in the Très Riches Heures du Duc de Berry in the Museé Cluny shows the labors of a fairly typical winter day. This calendar page features an interesting technique in that the house on the bottom left is a cutaway or cross section that reveals the inside. A pair of peasants are warming themselves by the fire, less than decorously, as both the woman (in blue) and the man (wearing gray) have removed their lower garments in order to warm their legs—exposing their genitalia. I suspect the garments in question are hanging on the back wall of the house, behind them. Just outside the house, a woman who appears to be of a higher socio-economic class (based on her clothing and manners), has her skirts slightly raised to encourage the heat to warm her legs without being immodest; notice the way she is turned away from the display of the people inside the house. There’s a slightly weasel-looking cat near her feet. It seems to be a fairly prosperous farm, with a dove cote (see the doves feeding on the ground), dome-shaped bee hives, and a sheep-fold with plump sheep. Just to the right of the sheep-fold, a shivering peasant’s breath warms the air, an interesting detail for the era. Notice too the smoke curling upwards from the house’s chimney. The calendar proper in the semicircle at the top of the winter scene shows Aquarius on the left and Pisces on the right, and the chariot of the sun below them. The Golf Book (British Library Additional MS 24098) is a book of hours featuring the work of Simon Bening and his Bruges workshop, where the MS was produced sometime in the 1540s. The image for January (f.18v–19) features a snowy winter scene. In the background, a windmill works, and people are on the steps of a small church. Beyond the windmill and a church is a small figure on horseback and another kneeling in the snow. A man and a woman stand chatting in the path, near a bit of gate that looks very like a modern farm gate. In the foreground, inside a house with a smoking chimney and birds on the roof, a man stands at a small table, and a woman sits in a chair nursing a baby. You can just glimpse a bit of the fire, a winter convention in calendar pages. Outside the house a man in red stockings chops wood for kindling while a woman kneeling in the snow gathers the kindling in a sling-like bag looped across her shoulders. At the opposite end of the house you can see the attached byre with its cow. At the base of the page, several men are shown dragging another man on a sledge, an appropriate winter past time. The actual calendar page, on the right facing page, features a similar mirroring scene of men pulling a sledge, towards the left-hand scene. I’ve discussed The Golf Book before, particularly the May calendar image. The Da Costa Hours is in the collection of the Pierpont Morgan library. It, like the Golf Book hours in the British Library, was illuminated by Simon Bening (1483/84–1561); Belgium, Bruges, ca. 1515. I’ve written about the May calendar image from the British Library’s Golf Book. It’s very similar in terms of motifs to this one. On the calendar page itself the Gemini twins are featured in the rondel at the base of the page. Just as in the Golf Book calendar page for May, Bening in the Da Costa Hours features a boat with greenery and musicians celebrating May 1 and the arrival of Spring. Beyond the boaters (click for a larger image) you can see a castle, swans, and a group on horseback in the background. They too have been busy gathering the green boughs of May. Last August the Getty Museum announced that it has made 4,600 pieces of art from the museum’s collection free to use. They’re focussing on “public domain” works of art, that means works that have endured beyond the limits of copy right, and users are free to use, modify, and publish these works for any purpose. These are high-resolution, reproduction-quality images with embedded metadata, some over 100 megabytes in size. You can browse the images, or look for individual “download” links on the Getty Museum’s collection pages. Before the download actually begins, the Getty site asks simple questions about how you plan to use the images. There’s a well-written Getty Open Content Program FAQ. The Getty released images of many of its most famous works, including paintings like Vincent van Gogh’s Irises, but I’m especially excited by the medieval manuscripts (The Getty purchased the Ludwig collection, a huge collection of manuscripts rich in psalters and books of hours several years ago, and already had a solid collection, and they’ve added mss. since).